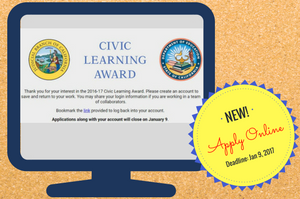 Applications are now available for the 2016-17 Civic Learning Awards. The awards celebrate schools’ civic learning efforts and identify best practices that can be replicated throughout the state. Co-sponsored by Chief Justice Tani G. Cantil-Sakauye and California State Superintendent of Public Instruction Tom Torlakson, the awards are part of a statewide collaborative effort to revitalize civic education for all California students. In its fifth year, the Civic Learning Awards have recognized more than 100 public schools of all grade levels across California. New this year, schools can fill out and submit their applications online. All public schools in California are encouraged on apply.